Here are 10 of my recent discoveries, many of them Pinterest finds. 2. And one hanging on our mud room door for the kids’ winter hats and gloves. 3. This one is so simple, I can’t believe I didn’t think of it until just a few months ago. We’ve gone from keeping all the kids’ shoes in one big bin (and tossing them all out to find the one at the bottom), to keeping them all neatly lined up and clearly visible on these 2 sets of shelves from Target. 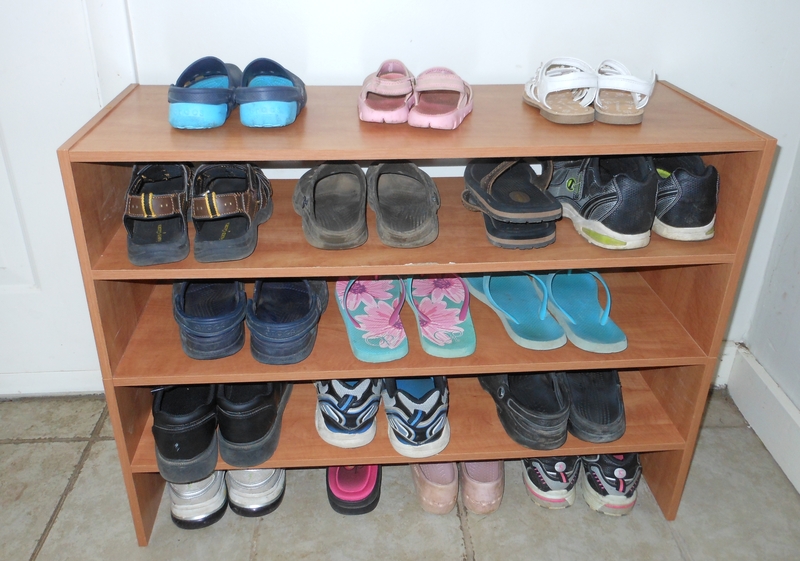 (Also available at amazon.com ) Thirty dollars and 15 minutes of my husband’s time later, this shoe rack was assembled and lined with rows of kids shoes — beautiful order! 4. 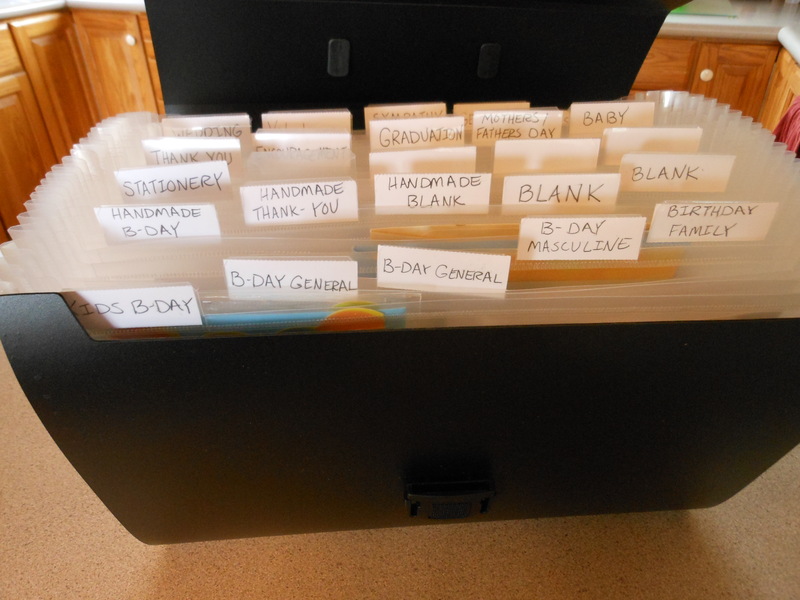 I had an empty expanding file box so I filled it up with all the extra cards that were floating around my desk drawer. Now if I need a card for a particular occasion, I know right where to look. 5. 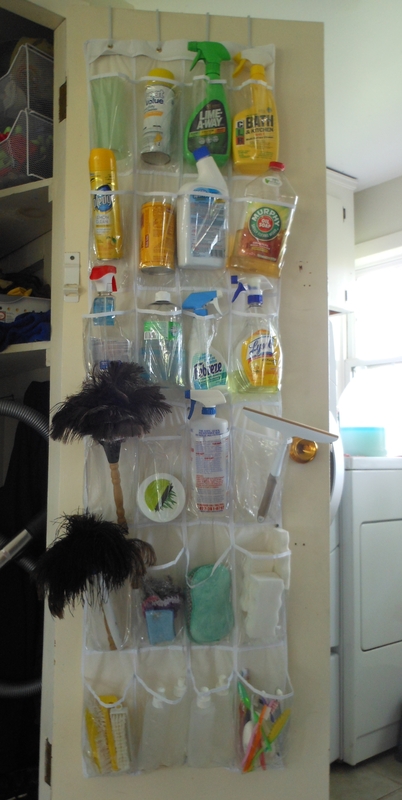 I needed more space to store all our toiletries and first aid supplies in our bathroom wall cupboard. 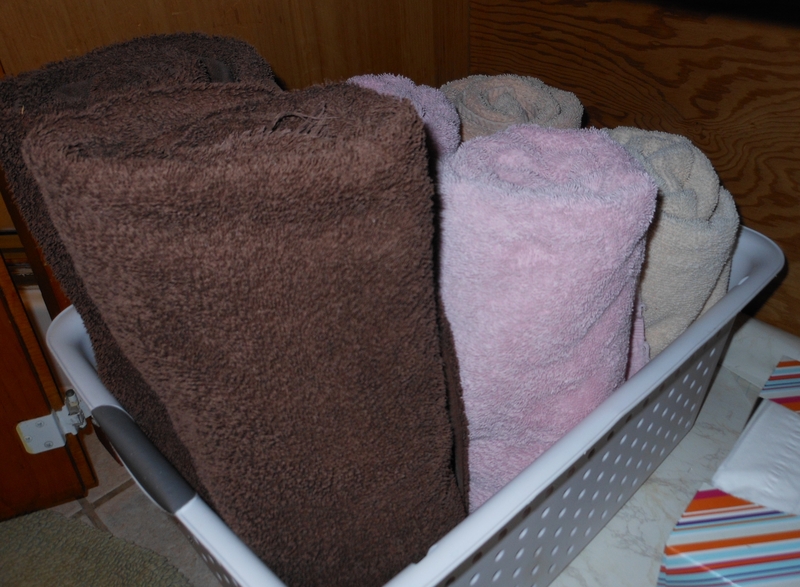 So I moved the towels I had kept folded on the lower shelf, rolled them up and put them in a basket under the sink. 6. 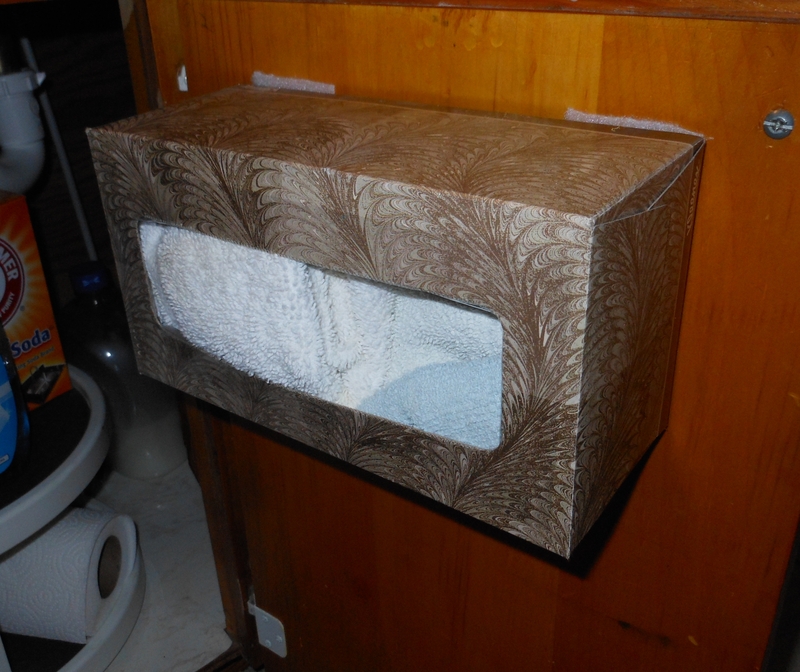 This tissue box is mounted with industrial strength velcro to the inside of the bathroom sink cupboard door. It holds rags for the kids to use for their daily bathroom cleaning chore — wiping down the sink and toilet with Windex and a dry rag. 7. 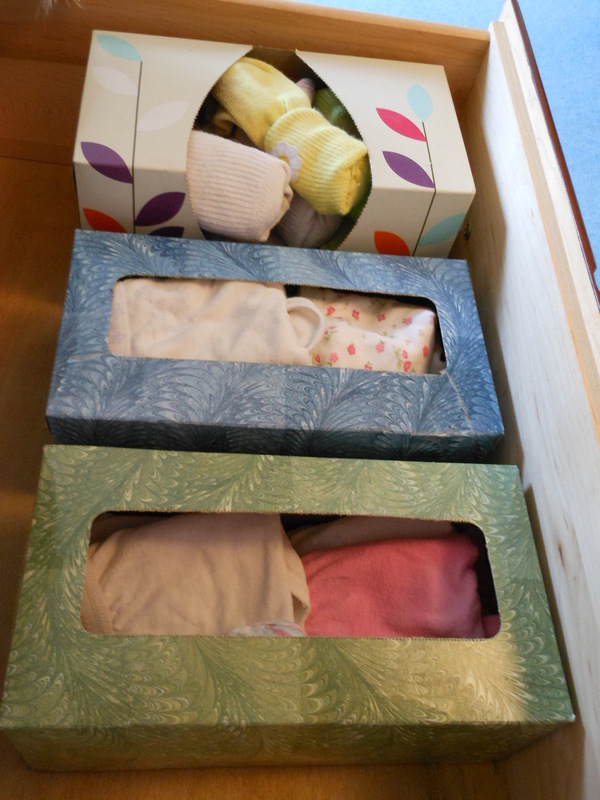 And here’s another fantastic use for empty tissue boxes: holding underwear and socks in the kids dresser drawers. 8. Speaking of kids’ dresser drawers. Here’s a tip I learned from my sister when her teenagers were toddlers. 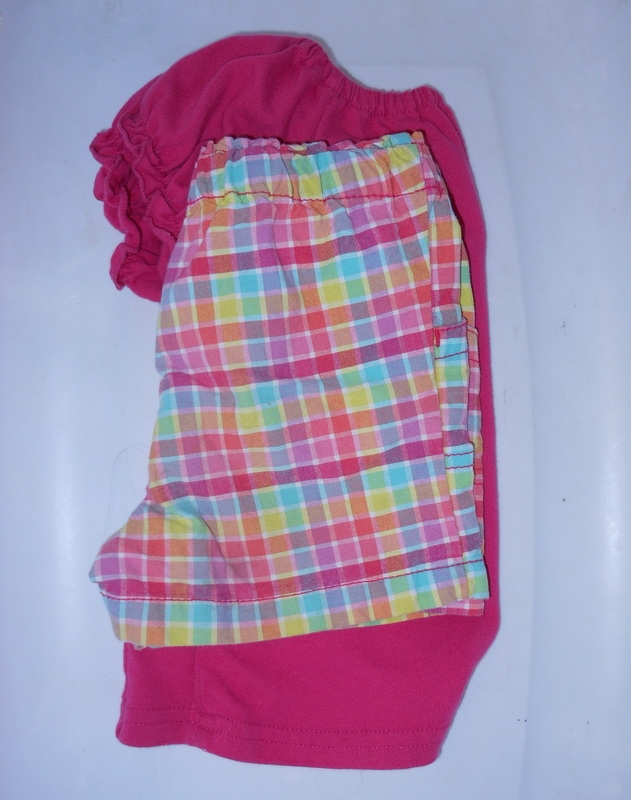 To make putting on their own clothes a snap for toddlers/preschoolers, fold the tops and bottoms of their outfits together into one bundle. That way they can grab a “pack” of clothes and be sure that they have a matching outfit. 9. Another tip for kids’ clothes. 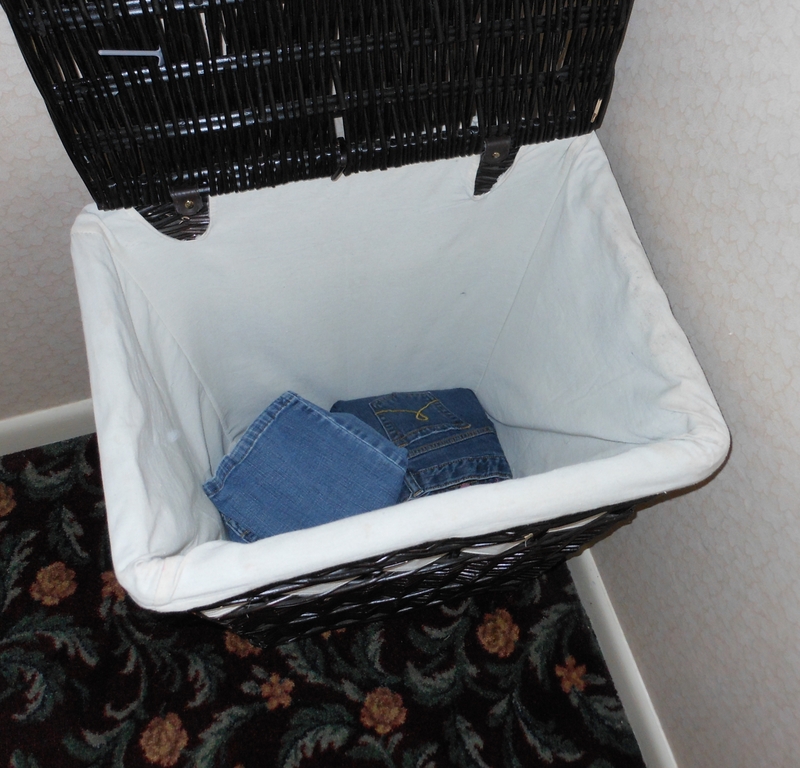 Keep a hamper in a central location (ours is in the upstairs hallway) to toss clothes in when they no longer fit. 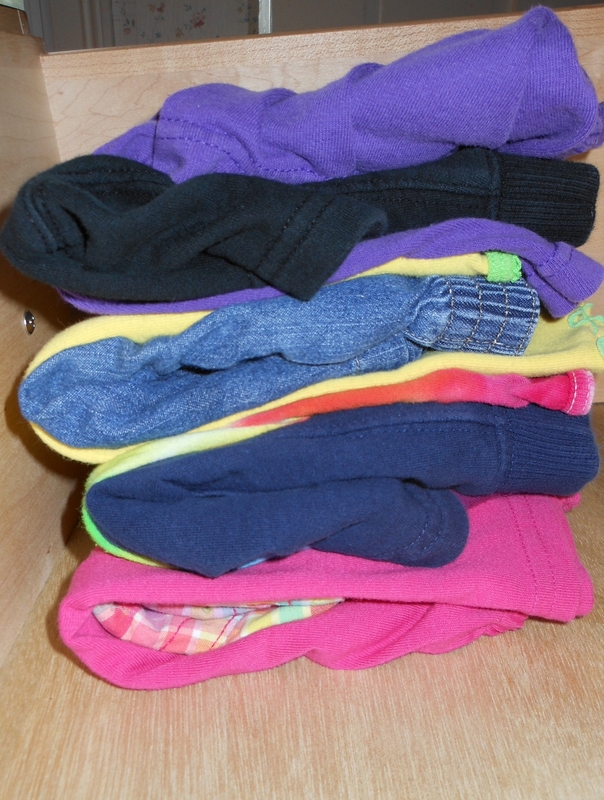 When I tell the kids their pants are too short, or when they tell me they never where a shirt because they don’t like it, I no longer have to dig through the boxes of stored clothing to put it with the other clothes of that size. 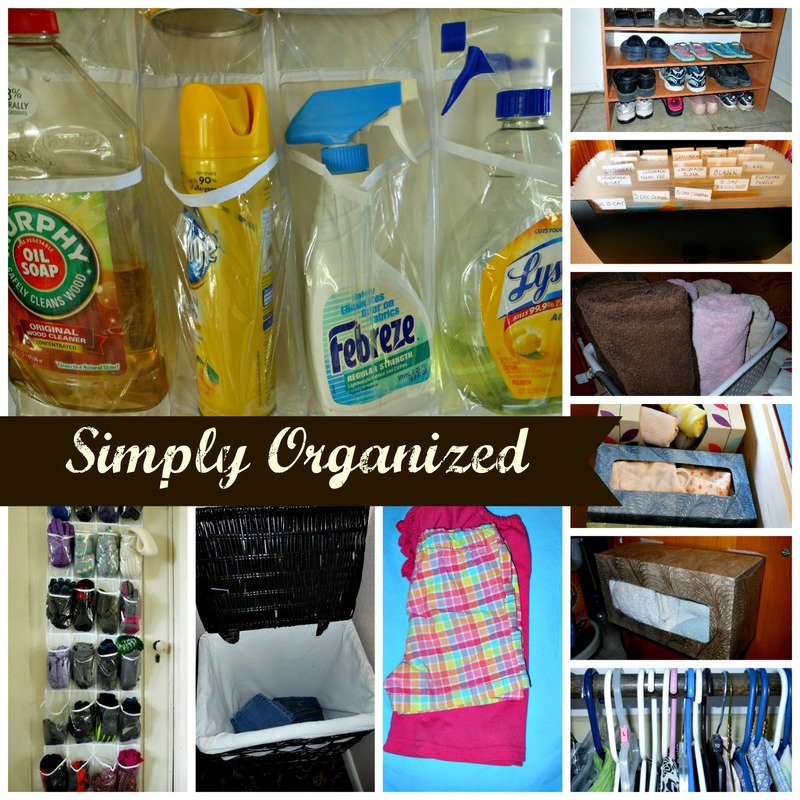 When the hamper gets full, I sort the clothes to go to Goodwill, or to go back in the boxes of hand-me-downs. 10. 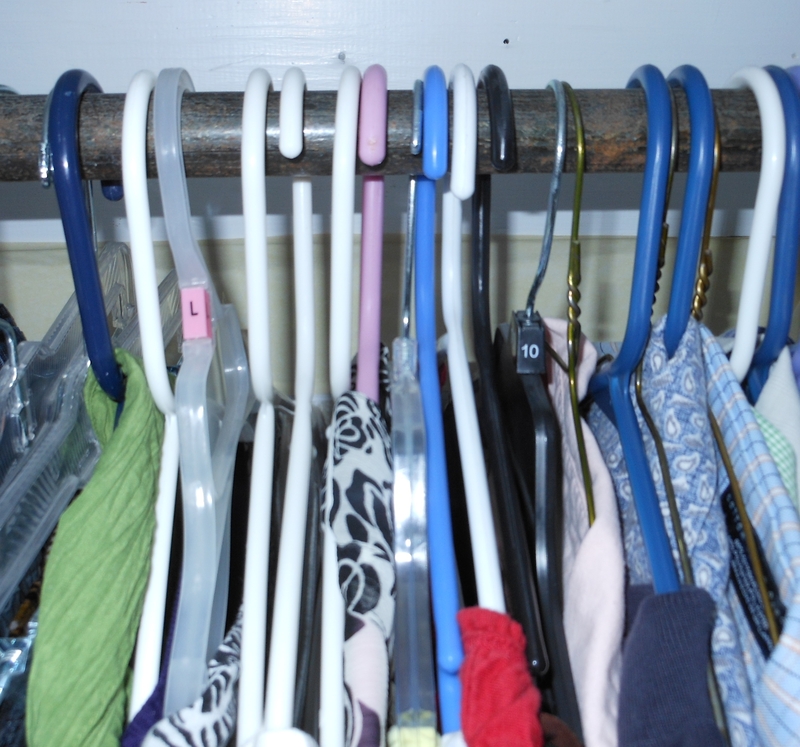 And finally, when I first bring out the next season’s clothes and hang them in my closet, I turn the hangers backward. As I wear them, I turn the hanger the other way around. At the end of the season, I’ll be able to tell which ones I never wore, and can donate them or otherwise get rid of them. Next Post Our Three Favorite Bar-Cookie Recipes, Featuring……the Best Brownies Ever! I love the hanger idea. I have never thought of that! Thanks. Thanks for these great ideas, Rachel! I love your tissue box ideas! Where did you buy industrial strength Velcro? 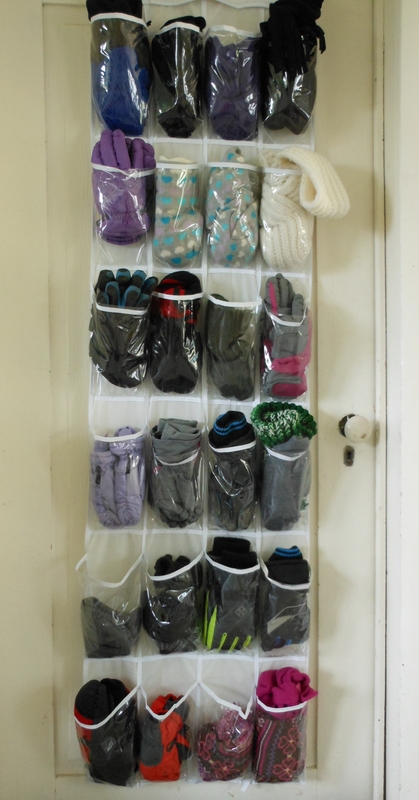 We have been using a sweater hanger in our front closet for kids’ shoes… a similar solution and it’s narrow enough to not take up the whole closet. PS We adore Shenandoah. I’m not too far from you, in Maryland. Thanks for stopping by and saying hi! I got the industrial strength velcro at Walmart — in the craft/sewing section along with the velcro dots, etc. It works great! Folding together sounds better than the hanging shelves I was going to try! And I love the backward clothes hanger idea! There are currently handi-men in my house installing new closet doors pretty much everywhere so I can use over the door storage! Bi-folds are both flimsy and inefficient! I love the folding tip! That could save me some explaining anout stripes with plaids– even for ones a little older than preschool. 😉 We love shoe holders for mittens, too! I’ve been using one for school supplies… flash cards, glue sticks, math manipulatives, scissors, etc. I’m now thinking about using one for the girls’ hair accessories and ribbons. Thanks for sharing your ideas! I guess I better save those tissue boxes! Oo! I love the tissue box idea of storing underwear and the hangers! I must try these out.